Zlatan Ibrahimovic scored the game-winning goal for the Los Angeles Galaxy against the Philadelphia Union. 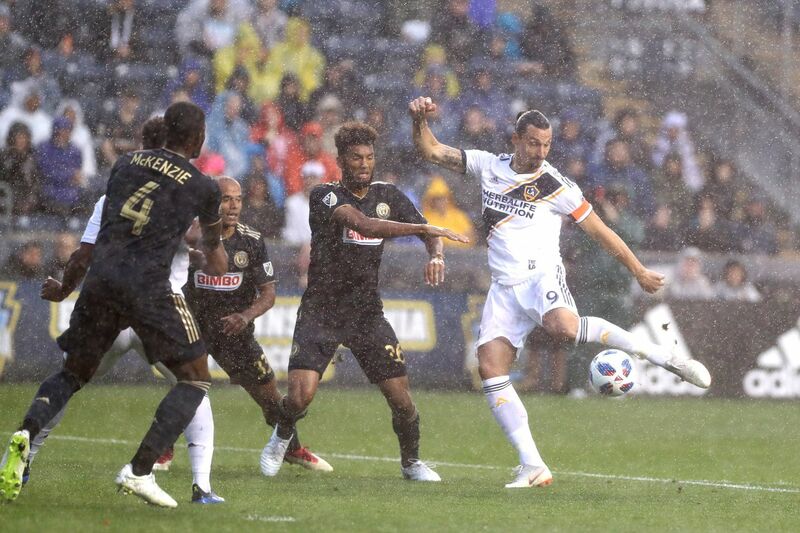 As expected, Zlatan Ibrahimovic brought many fans to Talen Energy Stadium on Saturday, even amid the endless rain that soaked Chester all night. The Union kept him, and them, quiet for the first half. But he was unstoppable in the second half, powering the Galaxy to a 3-1 win with a goal and an assist. "That one hurt," Uniom manager Jim Curtin said. "Once they got their rhythm, got a little confidence, it was a lot for us to handle." C.J. Sapong scored the opening goal, redirecting a Borek Dockal pass into the net in the 29th minute. It was the much-maligned striker's first goal since April 28, a drought of 11 games. C. J. Sapong deflects the ball just past a diving Bingham! Three minutes after halftime, Ibrahimovic made a big impact with the simplest of plays. He sent a short pass through the Union's back line toward Ola Kamara, who raced away for the tying goal. Fifteen minutes later, Ibrahimovic delivered what proved to be the game-winning goal, curling a first-time shot from just inside the 18-yard box. It was a rough moment for teenage centerbacks Auston Trusty and Mark McKenzie, who've played well for much of their debut season. After teaching them a lesson, Ibrahimovic offered praise for the duo. "It's not easy, two young guys with not so much experience… but I think they did a good job," he said. He also praised the fans who got what they came to see. "I feel sorry that it was raining and that it was windy, or else there would be even more," he said. "Hopefully they are happy. I gave them one goal. And the next game, they can see me on TV." It's worth noting that referee Nima Saghafi didn't do the Union (7-10-3, 24 points) many favors, especially in the first half when he whistled the Union for eight fouls and the far-more-physical Galaxy (9-7-4, 31 points) for five. But the Union hurt themselves later by allowing an L.A. team with a porous defense too much possession. Substitutes David Accam and Cory Burke helped, but not enough to produce an equalizer. Instead, L.A. got its third goal, as Michael Ciani slammed home a header off a Romain Alessandrini corner kick in the 82nd minute. It was the first time all year that the Union lost a game after scoring first, after winning the first six times. That's a sign of improvement for a team with a long history of late-game collapses. But those other six games didn't have a star like Ibrahimovic. "In all the games against the teams that maybe are toward the upper echelon and have some star players … we've come up just a little bit short," Curtin said. That part hasn't changed over the years.